This will go a long way in helping show that the smart while small and often referred to as "cute" is definitely something any man can be proud of owning. I'm far from ashamed that I own and drive a smart daily, in fact before I bought my 2008 smart I was driving a $70,000 BMW X5 and very happily switched into the smart. As it's not about the price or the name on the car, it's about what you get and with the smart you get one amazing vechile. Owning a smart is something to be proud of as not only are you making an environmental and culture statement but the styling is very sporty and elegant at the same time. I love cars and have owned a few but my smart is definitely one of my favorites. While style is always subjective to different view points, if you are still undecided about the smart all you need to do is drive it for 5 minutes and you'll become a smart enthusiast. 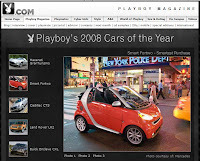 thinking of the smart as a "car" is like thinking of Vegas as a "city" yes the smart is a car but its much more then that and until you've actually driven/seen one its hard to understand what the hype is about.